Discussion in 'Strategic & Foreign Affairs' started by Bill Longley, Apr 12, 2019. The word Deterrence is derived from word Deter which means to stop, discourage (someone) from doing something by instilling doubt or fear of the consequences. Nuclear weapons are extreme weapons. A single nuclear bomb can destroy cities and can bring unbearable loss in both human and financial terms. Nuclear weapons are seen as the ultimate deterrence to stop war as the use bring unmatched misery not to country against which it may be used but also its fall out which can damage globally. Atomic capability create Terror and in case of Pakistan and India, both overt nuclear powers, has created balance of Terror. Prior to Indian and Pakistani nuclear tests in May 1998, India was much stronger then Pakistan in comparison of elements of national power. The balance of Power was in India’s favor but after Pakistan’s atomic tests balance of power became irrelevant and from that day balance of terror is prevailing between both rival countries. Before moving further let us see how deterrence is created? IS processing nuclear bomb is enough for creating deterrence or there are other requirements? There are three parts / requirements of nuclear deterrence without full filling these requirements deterrence is not complete. First requirement is communication. A state communicate to its opposing state that it has nuclear capability and it wants other side to respect its sovereignty and interests and lays a red line which if crossed by rival , will bring unbearable retaliation/ punishment to him. For installing l fear and respect to other side only communication is not enough so the second requirement of deterrence is display of capability. You have to display your capability through which you deter your foe. Indian called Pakistani capability a bluff. Especially after Indian tests of 13 May 1998 the tone of Indian leadership changed and heat was felt across LoC in Kashmir. Pakistani counter tests gave a shut up call to Indians and things started to cool because only Power respects Power. Strike capability which include Air crafts /bombers capable of delivering nuclear payload, Missals to hit enemy deep inside its territory to refuse any strategic depth. Restrike Capability, so that if enemy takes initiative, you have capacity and capability to strike back with full force so that enemy don’t dare to challenge and cross red line. This ability comes with Submarine launched Missiles and missals which are beyond enemy reach and knowledge. Third is the most important requirement , Deterrence is not complete if there is NO POLITICAL WILL , will to climb escalation ladder , to give signal to opposing side that he will be punished hard if he dare to cross red line . To clear enemy that WILL to go to any extent irrespective of any threat of damage enemy can inflict is present and enemy should watch out. After having an idea of Deterrence and how it is completed let us analyze Indian Surgical strikes of September 2016 and Balakot attack which Indians like to call Surgical Strike II of 2019. On 18 September 2016 Indian Army position in Uri cantonment was attacked by Kashmiri militants .This attack resulted in killing of 19 Indian soldiers. Indian army was at low morale and after Gurdaspur and Pathankot, it was trying to hide its failures by accusing Pakistan for their every failure. On 19th September Indian Army’s DG MO Lt Gen Ranbir Singh threatened Pakistan that “(Indian Army) reserved the right to respond "at the time and place of our own choosing”. On 29th September Indian army disclosed that it has raided an alleged militant launch pad across LoC. Indian side called this raid a surgical strike. 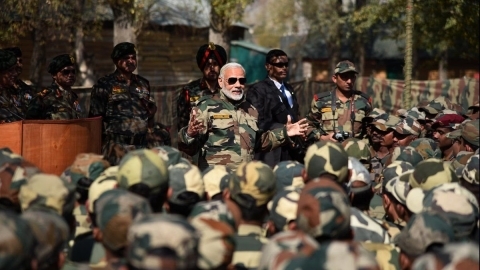 The term surgical strike used for the alleged raid became a new sensation and resulted in surge of Nationalist Passions which helped Modi Sarkar tried to exploit in state elections. Indian leadership and Army were interpreting this raid as a new normal and Pakistan’s humiliation from Indian hands. It was now Pakistan’s turn. ISPRs taking journalists to Place of alleged surgical strikes made Indian army a laughing stock. Within India, people started criticizing and making fun of Modi’s fake surgical strikes. Then on 6th October 2016 Pakistani newspaper Dawn published a report filed by Cyril Almeida accusing Pakistani security establishment supporting militancy, this story became Dawn leaks. Was it a planted story or genuine, is another debate but this story brought criticism on Pakistan army and gave relief to Indian army and leadership. It enforced Indian narrative against Pakistan and damaged Pakistan army and states repute internationally. During this whole fiasco one thing was noticeable. There was no Political will to support armed forces.Government was not supportive to Pakistani forces because they believed Army was behind 2014 PTI and PAT dharnas. This lack of Political will and distrust between civil and military leadership, on one hand caused international embarrassment and on the other hand caused irreparable damage to civil military relations. In 2019, Scenario at the time of surgical strike II, was different. This time there was a complete synchronization between Political leadership and military leadership. That is why Pakistan’s response to Indian aggression of 26 Feb 2019 was quick and effective. Pakistan striked back within 24 hours after Indian air strike on Balakot which resulted in nothing more than eco terrorism. On 27th February Pakistani Planes striked Indian Positions across LoC. This skirmish resulted in air battle in which PAF shot down two IAF planes. Mig 21 was shot down by PAF JF 17 Thunder aircraft and fell on Pakistani side, where as other IAF SU 30 fell on Indian territory, in Budgam area. IAF Pilot Abhinandan was arrested but after 2 days returned as gesture of Pakistan’s goodwill. Pakistani boldness averted threat of imminent war. Synchronization between political, diplomatic and military efforts enabled Pakistan to achieve desired results. Political will of Imran Khan Government to go to any extent gave Pakistani deterrence full credibility. Pakistan came out as a mature power in south Asia who prefer peace over war but if challenged can go to any extent for its sovereignty and honor. Summing up Political will is the most important requirement for completion of credible deterrence. The 2019 episode proves that good civil military relations and a nationalist government with strong political will to defend a nation guarantees credibility to nuclear capability. If political will is absent then deterrence is sure to fail. Don't blame anyone else this blunder was made by ISPR itself. Now issue is 2nd Jet they shot down was SU-30 and now Pakistan is in talks with Russia for lot of weapons so we can't afford to piss of Russia also. It seems like the same theory that Americans can't digest the shootdown of F-16. Sukhoi is a big bird. Can't be hidden. The fact that PAF shot 2 IAF Jet Mig 21 and Su30 MKI gives me endless bliss of cheerishment. Destroy these thied class b rated liar Indians who hide thier losses behind constant lies while the whole woeld made a mockery out of India.